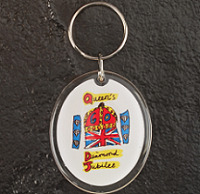 Small but recognised, these Company Jubilee Printed Keyrings are an ideal promotional business gift to hand out to customers during the Queen's Diamond Jubilee. Attach to your set of keys and this momento keyring will expose your Company brand name and logo many times over for many years to come. With such a special occasion such as 60 years of Queen Elizabeth II's reign on the throne of Britain, why not hand out some personalised Company Jubilee Printed Keyrings to customers to increase your profit margin? For a FREE QUOTE, please fill in the form regarding our Company Jubilee Printed Keyrings and we'll be able to help you.